perform the work in the position for which the spouse seeks to apply the preference. Are you a resident of the State of Idaho? . . . . . . . . . . . . . . . . . . . . . . . . . . . . . . . . . . . . . . . . . .
enlistment papers? . . . . . . . . . . . . . . . . . . . . . . . . . . . . . . . . . . . . . . . . . . . . . . . . . . . . . . . . . . . If you’re no longer enlisted, were you discharged under honorable conditions? . . . . . . . . . . . . . 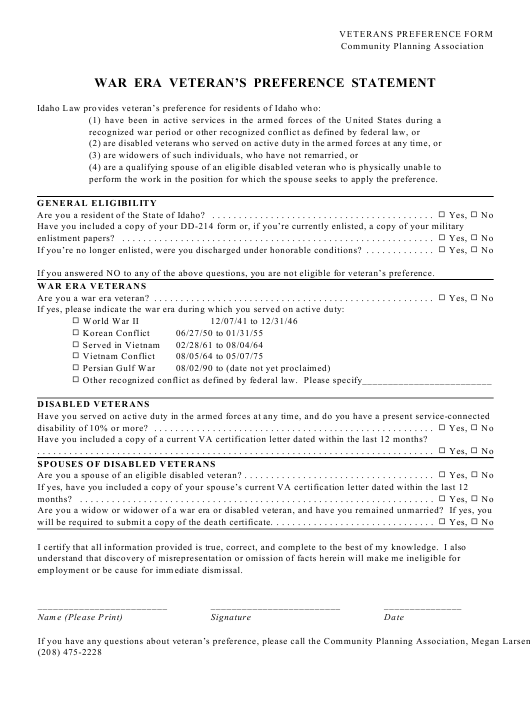 If you answered NO to any of the above questions, you are not eligible for veteran’s preference. Are you a war era veteran? . . . . . . . . . . . . . . . . . . . . . . . . . . . . . . . . . . . . . . . . . . . . . . . . . . . . .
disability of 10% or more? . . . . . . . . . . . . . . . . . . . . . . . . . . . . . . . . . . . . . . . . . . . . . . . . . . . . .
Have you included a copy of a current VA certification letter dated within the last 12 months? Are you a spouse of an eligible disabled veteran? . . . . . . . . . . . . . . . . . . . . . . . . . . . . . . . . . . . .
months? . . . . . . . . . . . . . . . . . . . . . . . . . . . . . . . . . . . . . . . . . . . . . . . . . . . . . . . . . . . . . . . . . . .
will be required to submit a copy of the death certificate. . . . . . . . . . . . . . . . . . . . . . . . . . . . . . .
employment or be cause for immediate dismissal.